The owners of the Pikes Peak Cog Railway announced in January 2019 that they would be re-opening the famous and iconic tourist attraction in 2021. Please refer to the Cog Rail Website for further information. There are typically three ways to reach the summit of Pikes Peak: The Pikes Peak Highway, the Barr Trail and the Pikes Peak Cog Rail. If your style is more passive, the Cog Rail is the option for you! All you have to do is sit back and let someone else do all the work while you ride the world’s highest cog train and the highest train in America! What is a Cog Train? 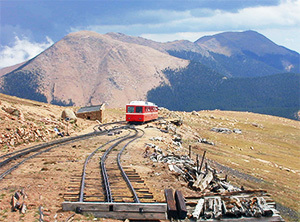 The Pikes Peak Cog Railway uses a unique cog and gear system to power itself up the steep slopes. The two outer rails on most train tracks are used to transfer power from the locomotive’s engine to the wheels and subsequently to the rails. However, due to the steep incline on this track, normal train wheels would just spin on the rails. So, the Cog Train uses a toothed double rail in the center of the track, which enables the train to “grab” onto something on the way up the mountain. 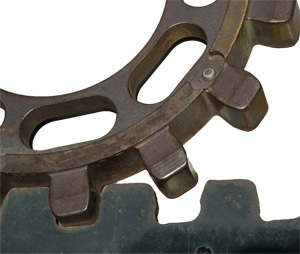 This cog and gear system also keeps the train from running away on the way down. The two outer rails on the Cog Rail are used only to keep the train stable and pointed correctly. The round trip to the summit of Pikes Peak (8.9 miles in length) takes a little over three hours. That includes 30 to 40 minutes at the summit for eating, shopping or simply looking out at the expansive views. The train’s conductors provide an excellent commentary along the way, including sights to see, strangely shaped and named rocks, flora and fauna and a good amount of history, too. So, we’ll let them provide most of the details. The train departs Manitou Springs (elevation 6,570 ft) and follows Ruxton Creek up through Englemann Canyon. Just after reaching Mike Marker 1, you’ll ride into Artist Glen and then into Minnehaha (elevation 8,332 ft.). Most of the railway to the summit is single lane. So during the busier summer months, the engineers use the switch at Minnehaha to allow the downhill train to safely pass the uphill train. You’ll also be able to use this short stop to check out Minnehaha Falls. At Mile Marker 2, the train will successfully take on Son-of-a-Gun Hill and then proceed to the site of the former Halfway House. Early photo of the Cog Train at Son-of-a-Gun hill. Photo by J.G. Hiestand, courtesy of the Special Collection Department at Pikes Peak Library. Just before Mile 3, you’ll proceed through Hell Gate and past Ruxton Park. To your left will be Pilot’s Knob Mountain as you continue up the rails. At Mile 4 (elevation 9,500 feet), you’ll pass another “passing lane” on the Cog Rails and get your first view of Pikes Peak in the distance. When you reach Mile Marker 5, you’ll really start to feel the cog rail engaging at the steepness of the incline increases. You’ll also get to enjoy the terrific views to the south as tree line fades below. Looking south from the Pikes Peak Cog Rail at about Mile 5. In the next couple of miles, you’ll pass Grecian Bend and Inspiration Point, and will then soon approach another rail switch at Windy Point (elevation 12,130 feet). On your right, you’ll see a small stone structure that was used by workers during construction and maintenance trips. On your left, you’ll see the former pump house that was used to supply water to the former steam engines. Keep your eyes focused on the hillsides as many Rocky Mountain Bighorn Sheep frequent this area. Also keep an eye out for the Yellow-bellied Marmot. Enjoy the views above tree line for the last three miles of the rail as you pass The Saddle, Slide’s Cut and Ghost Corner. At approximately 13,600 feet in elevation, just below the summit, you’ll pass one of the last switchbacks on the Pikes Peak Highway. Then, you’ll come up one last rise and reach the Summit of Pikes Peak. Most train riders seem to want to immediately head into the Summit House on their arrival. Don’t worry, there are plenty of donuts and merchandise items for everyone. So, take a leisurely stroll on the top of Pikes Peak and take in the views instead. Remember, you only get 30-40 minutes at the summit. The Cog Rail conductors will sound warning horns and the staff in the Summit House will remind you via their PA system. But….if you miss your train, it is a long and steep 8.9 mile walk down. There is no shuttle service down the Pikes Peak Highway. The Depot for the Cog Railway is located in Manitou Springs, just west of Colorado Springs on Highway 24. Take the Manitou Ave. exit and drive west 1.5 miles to Ruxton Ave. Turn left on Ruxton and continue about .75 miles. You’ll see the Depot on your left as you approach. Parking is available on the street and in parking lots across from the Depot. Depending on where you park, there may be a charge. 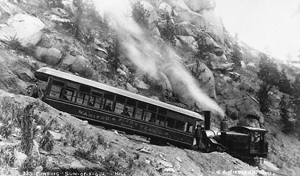 The Manitou and Pike’s Peak Railway was the brainchild of Major John Hulbert and several well-to-do men of that era. Over a span of almost three years, from 1888 to 1891, engineers and laborers surveyed, planned, blasted, and hauled rocks and fill dirt to complete the line all the way up to the summit from the Ruxton Valley in Manitou Springs. 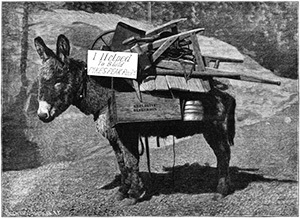 Grading the railway route involved blasting hillsides made of solid granite, and then moving the debris with burros, picks and shovels. Workers would come and go from five different camps on the mountain. In fact, it was said that there were always three gangs of workers on the mountain – one going up the mountain, one coming down the mountain and one working on the mountain. The actual laying of the track rails on the Cog Road began on June 11, 1890 and was completed four months later on October 20th. 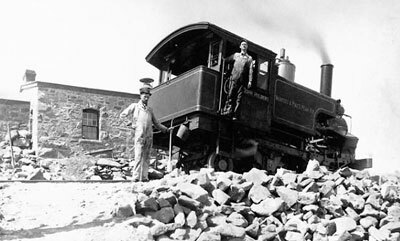 However, it wasn’t until June 30, 1891 that the first train completed the trip to the top of Pikes Peak. That’s when the Locomotive John Hulbert and the coach car named Denver delivered their passengers to the Signal Station (soon to be Summit House).